What do you think is the most likely reason for a water grid shutdown? It isn’t terrorism and it isn’t pollution. The answer is, the age of the infrastructure used to deliver the water or collect the sewage. Think about the city you live in. Chances are it has existed for hundreds of years, if not longer. Most cities water systems grow in phases. They keep adding to the network every year as the population grows. The end result is most cities have infrastructure that range from less than a year to hundreds of years and with many different materials. 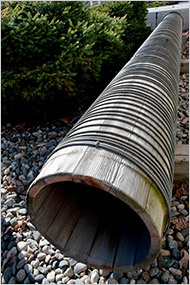 I have seen water mains made of wood in service as late as 2011. Like any piece of equipment it all has a useful lifespan, beyond that lifespan failures become increasingly more likely to be catastrophic. The result is a large volume and dollar amount of material and equipment that needs repairs or to be replaced. Normally the stress on water systems comes from population growth. A water main that was ok in the 1980’s may not be large enough for today’s population. As cities infill and build higher density buildings they frequently overburden the water systems. Either causing contamination or total failure of the system. Older equipment is also more susceptible to natural disasters, terrorism and human accidents. These three things can break a new system too, however they don`t have to try as hard with the older systems. Climate change is having an affect too. 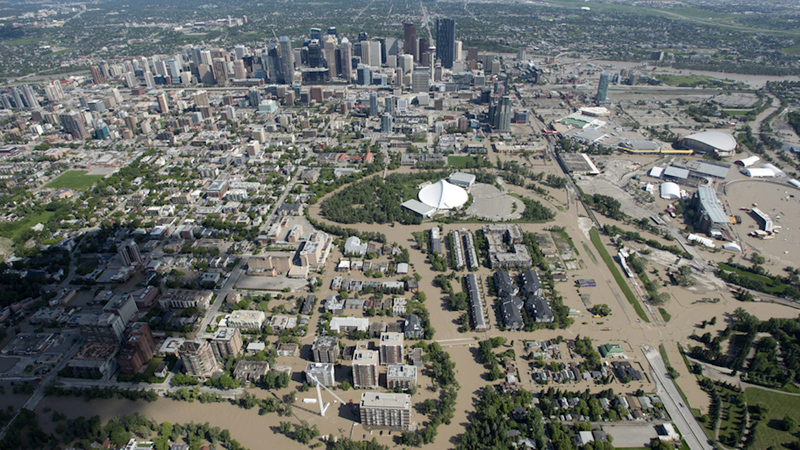 As severe weather events are on the rise, storm sewers might be found lacking, as was the case in Calgary, Alberta and Toronto, Ontario recently. The system was grossly undersized for the amount of rain that fell. They said things like “it was a month’s worth of rain in one day” on the news. When the fact is, it once was a months worth of rain, and is now something more frequent, lets say a weeks worth of rain. I’m not suggesting we build our systems to meet a 1000 year storm, but I am suggesting that our current idea of a 100 year storm may be an underestimation and that the error is getting worse. To bring it back to infrastructure, if we are built to the current 100 year storm levels, what happens if the 100 year storms are getting worse? We will find out in the not too distant future. What are the options for people to take? The first and most important thing to do is to plan ahead and replace older parts of the system before they fail. A $50,000 job to replace an old section of pipe at a time you choose is a lot cheaper than waiting for it to fail at the time you are least prepared. If you are connected to a public utility, ask them about their equipment replacement plan. If they are not looking 25 years into the future or longer then ask them why not? If you have private systems, you need to ask the same questions. Can you afford to replace the septic system when it fails? Or can you afford to dig/drill a new well when the casing cracks? As you can probably surmise the addition of more people + more rain + more water and more sewage means system failures will become more frequent and probably for longer periods of time. What does this mean to the average person? Plan for system failure. Have a backup system ready to go when it does. Know the age of your equipment and it`s expected lifetime. That way you wont be caught off guard. One of the areas of self-reliance I have been exploring is spending less money on disposable goods. My latest foray into a more self-reliant life is in the bathroom. Specifically,shaving. I was spending a lot of money on disposable razors. As I was growing up I gradually bought increasingly more expensive razors. I was suckered into the marketing machine around men’s razors. I believed that more blades was better. I also thought those moisture strips actually mattered. Eventually I was paying around $30 for a pack of four razors. At almost $30 for a pack of razors, they were my single largest expense for personal grooming. I lost my ability to pay for the latest and greatest razor when they came out with a razor that vibrated. I could not and still cannot see how a vibrating razor is better. First I started buying less expensive razors. But the quality of the shave left something to be desired. That and they only last for two or three shaves and it still felt like a waste of money. I recently purchased a straight razor because they can be sharpened and if they are properly maintained they can last forever. Using a straight razor is a simple way to save money. There are significant upfront costs. 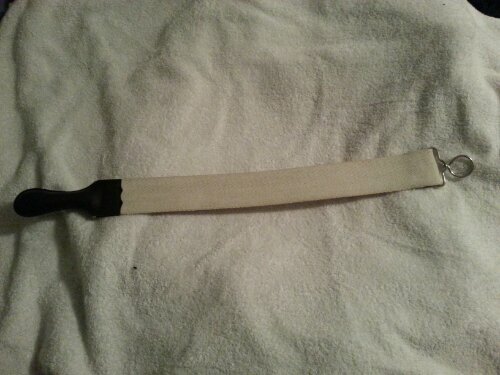 My razor cost $250 in a kit with a strop and shaving cream. By the end of the year it will have paid for itself in savings on disposable razors. Shaving with a straight razor is a different shaving experience. First it takes some nerves to place a four inch blade against your neck and face. 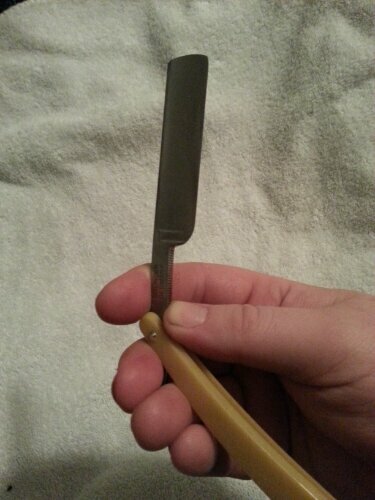 Remember this is the razor they are referring to when they say “razor sharp”. Second you hold it differently from a disposable razor. 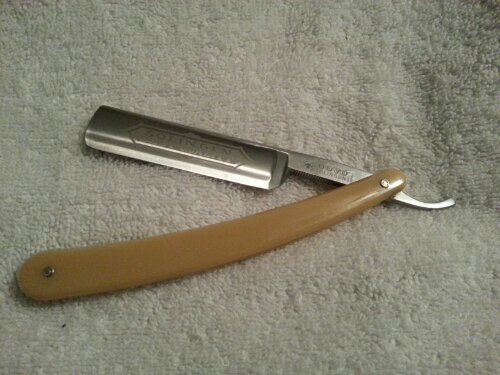 This takes some getting used to but once mastered the razor can be very finely controlled. The design is one of simplicity and perfection. There is very little need for improvement. The only thing disposable razors do better is elininal eliminate the learning curve. Shaving is simple once you get the knack for it. Holding the blade at 30° to the skin creates the perfect cutting angle. Any lower angle will result in poorer cutting and some pulling of hairs. As the angle gets sharper the risk of cutting the skin increases. If the blade is held correctly charging the blade’s angle is easy and following the contors of the face and neck very simple. Have confidence and go slowly to keep control, but fast enough for decent cutting. Better results can be achieved if the skin is warm and wet before starting. This will make all the hairs stand up. For an even closer shave you can shave against the grain. If the blade is still sharp there will be little chance of ingrown hairs. When finished, clean and dry the blade. Excess moisture on the blade can cause rusting and bacterial growth. Just becareful not to touch the cutting edge or else you might dull it or cut yourself. The cutting edge of the razor only lasts two or three shaves, just like disposables. Unlike disposables, this blade can easily be sharpened. Sharpening is also very simple. 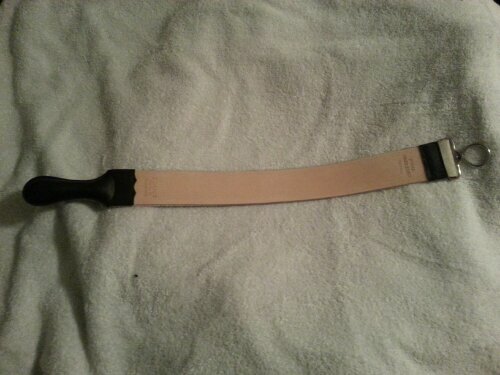 Holding the blade at 30° to the strop, run the blade backwards along the strop. NEVER run the cutting edge forward along the strop. Doing so will permanently damage the blade. Alternate with the leather and linnen sides and the cutting edge will be good as new. Do not sharpen the razor immediately after shaving. The edge will be slightly distorted from the hot water and sharpening will cause damage. This is enough information to get started. Hopefully you are inspired to get one yourself. Then you too could enjoy significant savings and the feeling of being just a tiny bit more self-reliant. Why is my water that color? As someone who works in water treatment I fequently receive questions about red, black, pink or cloudy appearances in drinking water. Contrary to what might be expected none of these colors are inherently dangerous to human health. They do however make the water look unappetizing. They are called asethetic water quality indicators. Well the colors themselves isn’t the indicator, what causes the water is. I will outline the causes below. Red water is usually caused by the oxydation of iron and iron bacteria. To be a little more accurate the color is a reddish brown, if you see a red that belongs in a paint can then I highly recommend NOT drinking it. 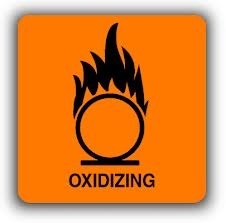 Iron oxydation (rust) is not dangerous at all. Many water sources contain iron naturally. Iron is prevalent in groundwater. The red color comes from iron particles rusting when they come into contact with oxygen in the water. The rusting is accelerated when the iron is introduced to chlorine. As you know chlorine is very commonly used as a disinfectant. When there is a lot of iron and a lot of chlorine then there can be a visible particles of rusted iron in the water. This looks really bad when you turn on the faucet but iron is something they add to mineralized bottled water and iron is a necessary element in proper nutrition. Iron bacteria can enter the water at the source or if the water is stored in a metal container or watermain. Wells can become contaminated with iron bacteria. When they do, read this to know what to do about it. Black colored water is not to be confused with black water which is a term used for sewage. 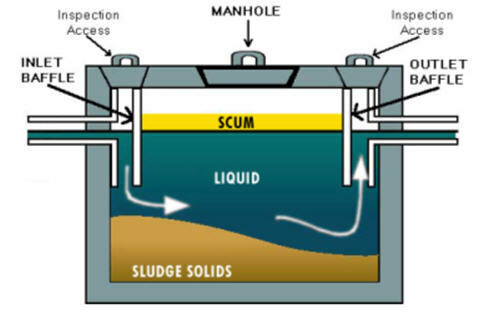 Sewage is often a yellowish brown, unless it has gone septic and then it is very black and very smelly. An odorless black tint to water is usually due to manganese. Manganese behaves a lot like iron does except it oxidizes a lot slower. Water stored for a couple days or more will turn black if there are high levels of manganese in the water. Manganese is more often found in groundwater than in surface water. Sometimes it wont be noticeable in the water. It will however be noticable as a black stain on appliances and reservoir walls. 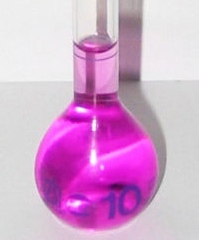 Pink water comes from potassium permanganate (KMnO4). Permanganate is a treatment chemical used to help oxidize iron and manganese. When too much is added the water turns pink. When a lot is added then the water turns purple. The pink isn’t dangerous to human health. It is hower alarming to see pink coming out of a faucet. To read how to use potassium permanganate as a disinfectant read this. 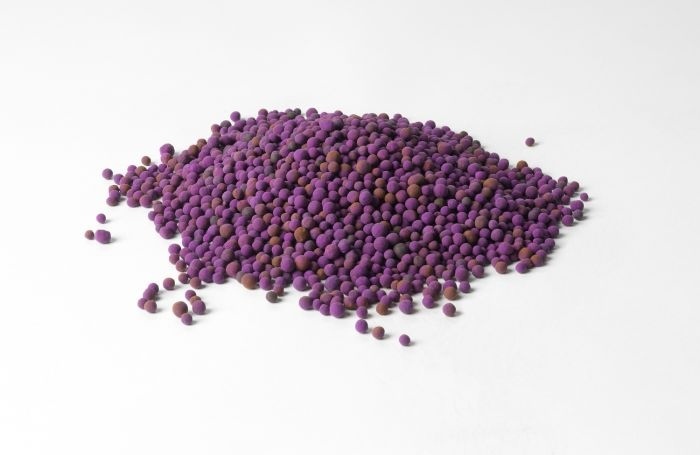 To remove iron, manganese and permanganate is accompolished with greensand filtration. 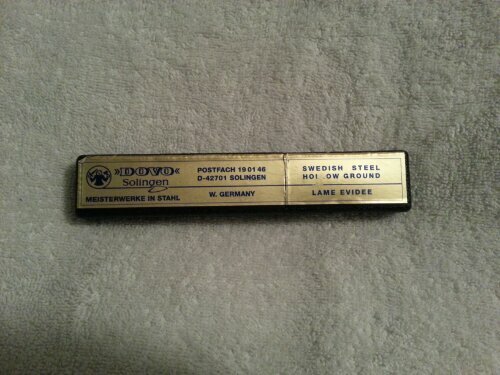 Don’t let the name fool you, greensand is black in color. Greensand is chemically activated to remove oxidized minerals from water. A yellowish tint (sometimes brown) to the water IS potentially dangerous. Yellow tea colored water is indicative of organic material in the water. Organic material is mostly non living particles but it also includes bacteria, viruses, and other pathogens. Sewage is also this color. So beware of yellowish water. Not many different things can cause a truely cloudy appearance to water. Turbidity is sometime said to be “cloudy” but it is caused by suspended particles blocking light from passing through. Usually turbidity is also colored at the same time. Unless the particles are white in color, then turbidity isn’t cloudy, it is dirty. Cloudy water is caused from dissolved gasses (usually oxygen) in the water getting released. This happens when the temperature in the water is significantly different than the temperature of surrounding environment. Since large bodies of water are slower to heat up and slower to cool down, this difference happens every spring and fall. It is called reservoir turnover. The way to test if it is just dissolved gasses in the water is to let a glass sit for five minutes. All bubbles of gasses will disappear and the water will look and taste normal. If the water is still cloudy after five minutes, then the problem is caused by turbidity and it must be removed by filtration. Not everything that can happen to drinking water is dangerous. Reddish tints from iron and blackish tints from manganese are natural and harmless. This article should help you determine when visual changes to the water are cause for alarm and when they can be ignored safely.